This course will give you a broad overview of the key aspects of HR. The program provides the tools to effectively handle issues related to performance management, recruiting, retention, compensation and some other aspects of HR. Participants who successfully complete the course will receive a Certificate of Human Resources Management from SHRM. Why choose SHRM Essentials for Human Resources? Developed by SHRM, the world’s largest HR association and leading advocate for HR professionals, the SHRM Essentials of Human Resources is the first introductory level HR program to incorporate components of the SHRM Body of Competencies and Knowledge provide insight into the standards for knowledge, strategies and competencies required of effective HR professionals around the world. While this program doesn’t prepare you for the SHRM-CP/SHRM-SCP certification exam, it helps set the stage for those interested in pursuing certification. Laura Hamidova received both Bachelor and Master degrees in Law and Social Studies from Khazar University (www.khazar.org). She is Certified Professional from Society of Human Resources Management, USA. (www.shrm.org). Also she holds a certificate in Human Resources Management from Wales University, UK (www.wales.ac.uk). Also her education includes a number of trainings and workshops from different trainers and legal professionals. She started her career in HR from Det.Al Aluminius and Vest Consulting, then she worked as an HR Coordinator for AMEC at the time when the company was responsible for BP’s EMS project Engineering and Design works. After this Laura joined Moore Stephens as the Recruitment and Talent Acquisition Manager. 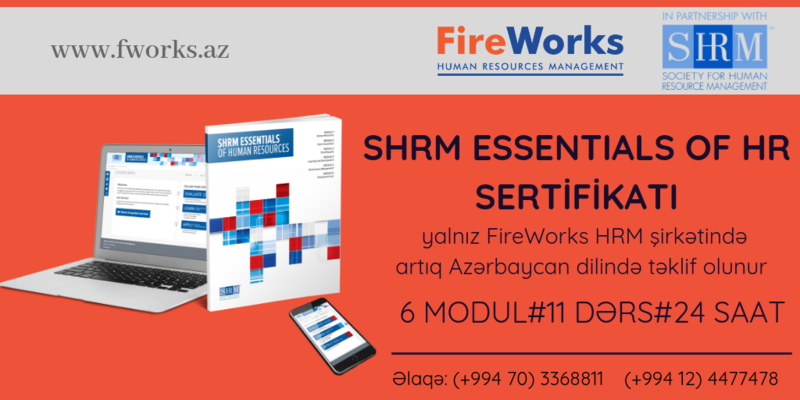 At the end of 2013 she established her own company – FireWorks HRM. Company who currently work with a variety of businesses in different sectors, providing Human Resources Management Services. For the registration please, download and fill in Course Enrollment form and send to the email: elnara.jafarli@fworks.az.